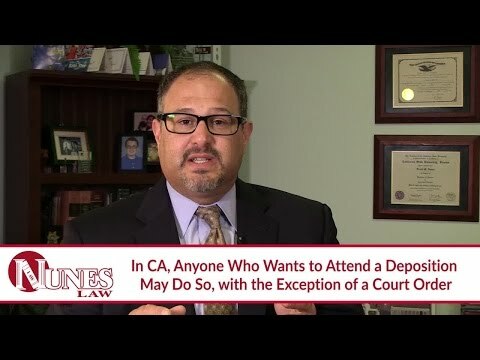 Who Is Allowed To Be At A Deposition In California? Listen as Frank Nunes explains who can attend a deposition in California. A deposition is a question-and-answer session that is conducted under an oath to tell the truth. In California, a deposition is treated just as if a person was giving testimony in court. The rules for California court proceedings allow nearly anyone to attend and watch, with few exceptions. Therefore, almost anyone who wants to attend your deposition is allowed to do so. Some witnesses choose to bring someone along for moral support when giving a deposition. An exception to this rule would involve a court order to exclude witnesses who may be testifying. This is done to prevent other witness perspectives from being influenced and potentially changed by the testimonies given at a deposition they would attend. By not allowing other witnesses to attend, these information sources remain separate. Watch the video to learn more. If you have additional questions about depositions and who can attend a testimony in California, I want you to call me at 559-436-0850. I welcome your call. Visit our firm’s educational website at https://www.nuneslaw.com, where you can view more videos and media content from our law firm.